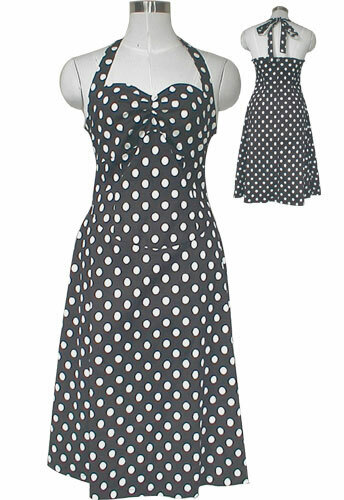 Reviews: Plus Size Rockabilly Black and White Polka-Dot Halter Dress  - $44.99 : Mystic Crypt, the most unique, hard to find items at ghoulishly great prices! You made me the happiest female in Texas! This is exactly what I pictured purchasing. I followed your advice and took my measurements. I received this dress and immediately tried it on. As you said, it was sized generously and I was able to fit it to my exact measurements. Nothing that a few darts took care in quick order. I love the fabric it's made of. Feels soft and feminine against your skin. It also has a soft give to it because of the spandex combined with the fabric. Easy care too! I preferred to remove my dress from the washer, shake it out and put it in the dryer on the lowest setting; taking it out just before it is dry, shake it out again and hang. No ironing needed. If you invision yourself in this dress, purchase it. You won't be disappointed in how wonderful you will look in it.